The Experiment Logistics Module - Pressurized Section, or ELM-PS, a component of the Japanese Experiment Module “Kibo,” as well as the Kibo Remote Manipulator System (RMS) and two of the experiment racks that will be installed in the Kibo Pressurized Module (PM), were shipped from the Tsukuba Space Center (TKSC) in December 2006 and arrived in the United States in March 2007. An End-to-End test of the Pressurized Module (PM), part of the Japan Experiment Module “Kibo,” was conducted on 4 and 5 October 2006. The test was conducted by linking JAXA’s Tsukuba Space Center (TKSC) to NASA’s Johnson Space Center (JSC) and Kennedy Space Center (KSC). On February 28, 2006, we conducted operations training for the Japanese Experiment Module (JEM), also known as "Kibo", using the Kibo simulator. On January 26, 2006, we conducted operations training for the Japanese Experiment Module (JEM), also known as "Kibo", using the Kibo simulator. Operations Simulation Training for the Japanese Experiment Module "Kibo"
Operations simulation training for the Japanese Experiment Module (JEM), also known as "Kibo," was conducted on Oct. 28, 2005.During this simulation, the Space Station Operations Facility (SSOF) at Tsukuba Space Center (TKSC) and the Johnson Space Center (JSC) were linked together. From October 24 to November 4, 2005, Kibo's Extravehicular Activity (EVA) Procedure Development Test No. 6 (OPS #6) was conducted in the Weightless Environment Test Building (WET) at Tsukuba Space Center (TKSC). An acceptance test is being conducted in Tsukuba Space Center (TKSC) on the Space Environment Data Acquisition equipment-Attached Payload (SEDA-AP). A thermal vacuum test of the Inter-orbit Communication System - Exposed Facility Subsystem (ICS-EF) is being conducted in the 8mφ Space Chamber at Tsukuba Space Center (TKSC). the visibility verification test for the Visual Indicator of the Space Environment Data Acquisition Equipment-Attached Payload (SEDA-AP) was conducted. Kibo's Extravehicular Activity (EVA) procedure development test No. 5 (OPS #5) was conducted in the Weightless Environment Test Building (WET) at Tsukuba Space Center (TKSC) from November 17 to 22, 2003. After the Multi-Element Integration Test-III (MEIT-III), various tests were conducted on Kibo's Pressurized Module (PM) from September to November in Kennedy Space Center, Florida. Multi-Element Integration Test-III (MEIT-III) was conducted at Kennedy Space Center in Florida, for the Kibo Pressurized Module (PM), and Node 2 (the connection module of the ISS main body), and the US Laboratory Destiny's simulator. After the Kibo Pressurized Module (PM) arrived in USA, the PM was transported to the Space Station Processing Facility (SSPF) in KSC. The Kibo Pressurized Module (PM) arrived at Port Canaveral adjacent to NASA Kennedy Space Center (KSC), Florida at 6:00 a.m. EDT, May 30. The Kibo Pressurized Module (PM) departed from Japan for NASA Kennedy Space Center (KSC) on May 2, 2003. Advanced Training #2 was conducted for NASDA astronauts Wakata and Hoshide, NASA astronaut Timothy Creamer, and ESA astronaut Paolo Nespoli in January, and for NASDA astronauts Doi and Furukawa, NASA astronaut Stepheng Bowen, and ESA astronaut Leopold Eyharts in March. Kibo Advanced Training phase 2 (#2) Pilot Course has been conducted with NASA and European Space Agency (ESA) astronauts from November 11 to December 13, 2002. Kibo's Extravehicular Activity (EVA) procedure development test No. 4 (OPS #4) was conducted in the Weightless Environment Test Building (WET) at Tsukuba Space Center (TKSC) from November 4 to 22, 2002. Additionally, Weightless Environment Test System (WETS)-EVA training No. 3 was conducted for Japanese astronauts from November 4 to December 12, 2002. 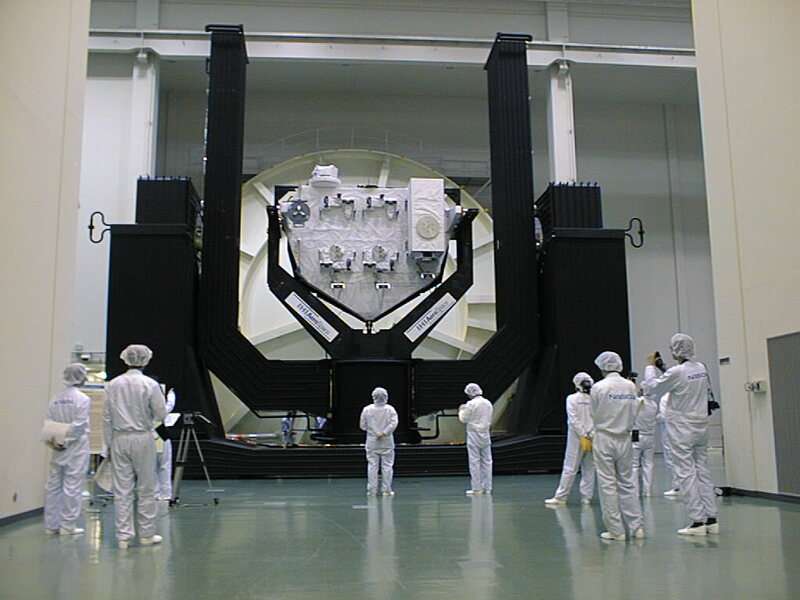 A Kibo Pressurized Module (PM) module leak test was conducted at Tsukuba Space Center (TKSC) from August 19 to 24, 2002. An interface test between the ICS, which will be flown on board Kibo in the ISS, and the DRTS ground station was performed from June 3, 2002 to June 20, 2002 in Tsukuba Space Center . The ICS-DRTS ground station interface test verifies the ICS and the DRTS ground station in TKSC can communicate properly via DRTS. Kibo's total system test has been conducted at Tsukuba Space Center since last autumn. All Kibo's components were connected to check its function and performance as a whole module. The advanced training of Kibo, the Japanese Experiment Module, was started at Tsukuba Space Center in December 2001 for astronauts who will work aboard the ISS. The advanced training is one of the two training courses for astronauts who will be assigned to the ISS, advanced training and increment training. Advanced training is conducted by each international partner (IP). The training started this month is for Kibo's Pressurized Module and Experiment Logistics Module-Pressurized Section. Kibo's Extravehicular Activity procedure development test No. 3 (OPS #3) was conducted in the Weightless Environment Test Facility at Tsukuba Space Center from November 5 to 26, 2001. Pressurized module Kibo of the Japanese Experiment Module arrived at Tsukuba Space Center. Kibo, the pressurized module of the Japanese Experiment Module, left Tobishima Plant of Nagoya Aerospace Systems Works, Mitsubishi Heavy Industries, Ltd., and arrived at Tsukuba Space Center on September 25 early in the morning. Its shipment ceremony was completed on September 14. On September 14, 2001, a shipment ceremony of the Pressurized Module of Kibo was held at the Tobishima Plant of Nagoya Aerospace Systems Works, Mitsubishi Heavy Industries, Ltd. After the ceremony, the module was shipped to Tsukuba Space Center. Assembly of the Image Processing Unit (IPU) for Kibo's Multiuser Experiment Facilities was completed, and the IPU was opened to the press at Tsukuba Space Center on September 4, 2001. The second "Kibo" pilot training for the Japanese Experiment Module Instructor Evaluation was conducted at the Tsukuba Space Center from 20 to 28 August, with ESA astronaut Mr. Reinhold Eward and ESA Columbus Module instructor Mr. Christian Steinhoff as invited trainees. The Flight Crew Interface Test (FCIT) of Japanese Experiment Module Kibo's Experiment Logistics Module-Exposed Section (ELM-ES) was conducted by NASDA astronauts Doi and Hoshide on July 17, 2001, at Tsukuba Space Center. In July 2001, the Pressurized Module System Test of the Japanese Experiment Module "Kibo" is being conducted at MHI Nagoya Aerospace Systems. This test was started from October 2000 and will be continued until September 2001. The system test is now in the final stage and in July an integrated functional test to check the consolidated function of the experiment facility are being conducted. After completing this test, the Pressurized Module will be delivered to Tsukuba space center to conduct a total system test, combined with other components such as the Exposed Facility and the Manipulator from October 2001 to April 2002. The second operability evaluation test of the robot arm for Japanese Experiment Module "Kibo"
The second operability evaluation test of the robot arm for Japanese Experiment Module "Kibo" of the International Space Station was held at Tsukuba Space Center from May 21 to June 1. Here is the report of the May 23 test that was conducted by Japanese astronaut Wakata. 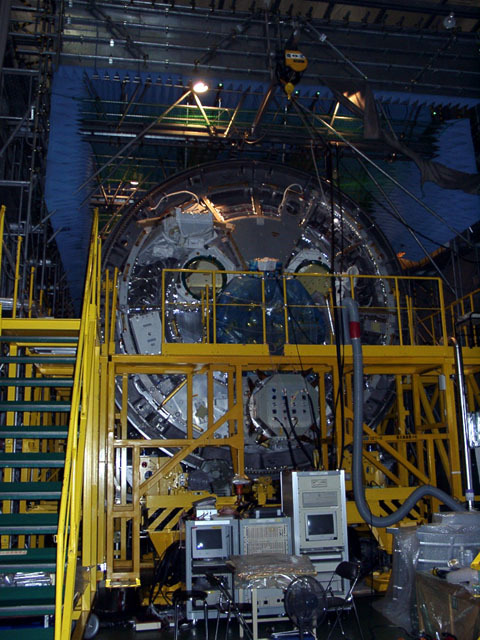 The Gradient Heating Furnace (GHF), an experiment facility in the Pressurized Module (PM) of the Japanese Experiment Module "Kibo," has been manufactured and was presented to the press at IHI's Mizuho factory on April 26, 2001. GHF is a multipurpose furnace consisting of the Material Processing unit (GHF-MP), which directly controls heating and cooling of samples; the GHF Control Equipment (GHF-CE), which controls the overall operation of the GHF and communicates Kibo; the Sample Cartridge Automatic Exchange Mechanism (SCAM), which can automatically exchange 15 Sample Cartridges (maximum); and the SCAM Control Equipment (SCAM-CE). It is mainly used for conducting experiments such as crystal growth of semiconductors. GHF is scheduled to be launched in the Kibo PM in February 2004. Kibo's Extravehicular Activity (EVA) procedure development test No. 2 (OPS #2) was conducted at Tsukuba Space Center from the end of November 2000 to March 6, 2001. Assembly of Experiment Logistics Module-Exposed Section (ELM-ES) of Japanese Experiment Module "Kibo" was completed at the factory and it was transported to Tsukuba Space Center on Dec. 27, 2000 for a system test. On Feb. 20, 2001, it was opened to press at Tsukuba Space Center. 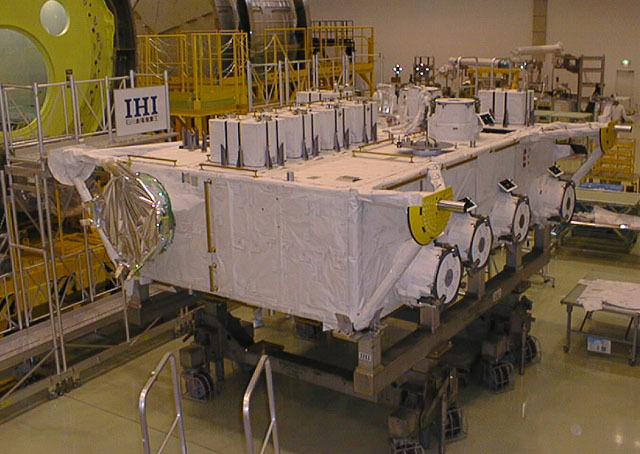 ELM-ES is a Japan's original reusable transfer pallet for transporting experiments to Kibo Exposed Facility. Its first launch is scheduled in January 2005. Japanese astronaut Souichi Noguchi and NASA astronauts Michael Foreman and Mark Lee conducted Japanese Experiment Module (JEM) Kibo Pilot Training from November 30 through December 13, 2000. The Exposed Facility of "Kibo" Japanese Experiment Module was transported to Tsukuba Space Center from an IHI factory in Nishitama-gun, Tokyo, by a trailer truck from Nov. 27 through 29, 2000, to undergo system testing. On Dec. 14, it was opened to the press at Tsukuba Space Center. Once in orbit, the Exposed Facility will be continuously exposed to and will be utilized in the space environment. 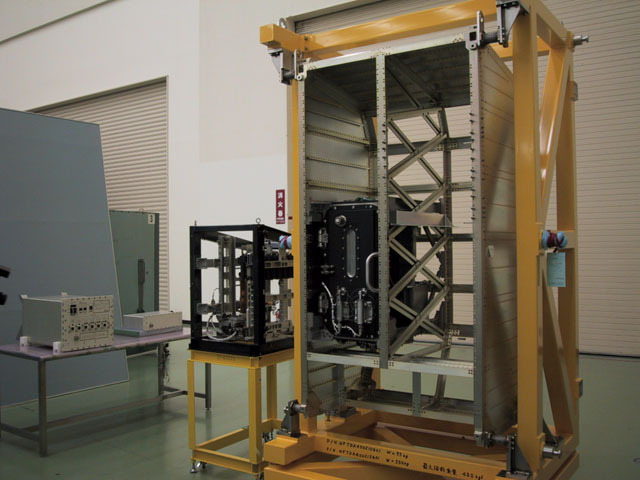 System racks were installed in Kibo's pressurized module at Nagoya Aeronautics and Space Systems Tobishima factory of Mitsubishi Heavy Industry from Sep. 5 to 26, 2000. Subsystems that control Kibo's power, communications, and thermal control systems are installed in the system racks. Common Berthing Mechanism Acceptance Test of the Japanese Experiment Module"Kibo"
The Common Berthing Mechanism Acceptance Test of the Japanese Experiment Module "Kibo" was conducted at Tobishima factory of Mitsubishi Heavy Industry from June 27 to July 2, 2000. The Flight Crew Interface Test (FCIT) of the Japanese Experiment Module "Kibo's" Pressurized Module was conducted on May 25, 2000 at Tsukuba Space Center. Japanese Experiment Module Kibo's Experiment Logistics Module-Pressurized Section to arrive at Tsukuba Space Center ! Japanese Experiment Module Kibo's Experiment Logistics Module-Pressurized Section (ELM-PS) was transported to Tsukuba Space Center from May 13 to 18, 2000. NASDA will conduct a neutron measurement inside the International Space Station (ISS) using the NASDA-developed Bonner Ball Neutron Detector (BBND) located in the US experiment module of the ISS from February 15 to August 23. The Main Arm Assembly Test was conducted from July to December in 1999. The JEMRMS Console Assembly Test began in May 1999 and is still underway. NASDA has been participating in the Long-Term Isolation Test in Mixed Cultures being conducted in Moscow, Russia, by the Institute of Biomedical Problems since last July. An Electromagnetic Compatibility Test of Kibo's Manipulator main arm was conducted. A Thermal Vacuum Test of Kibo's Manipulator Main Arm was conducted. A Hyper Velocity Impact Test of Kibo's Debris Shield was conducted. Space Suit's Functions, Capabilities and Necessary EVA Preparations ware conducted. A functional test of Kibo's airlock was conducted. Testing of airlock hatches and the slide table is reported. A maintainability test of the Japanese Experiment Module Kibo's Environmental Control and Life Support System (ECLSS) and Thermal Control System (TCS) rack was conducted in July. Here is the report. Japanese Experiment Module Kibo's manipulator console acoustic test was conducted at Tsukuba Space Station. The test is introduced here. A Modal Survey Test was conducted on the Pressurized Module (PM) and Manipulator of Kibo (the Japanese Experiment Module, JEM) at Tsukuba Space Center. Here is the report. A NASDA person visited the Asuka factory of Mitsubishi Heavy Industry in Nagoya, and interviewed the key persons about manufacturing Kibo, the Japanese Experiment Module (JEM). In this factory, Kibo's Pressurized Module (PM), and Experiment Logistics Module-Pressurized Section (ELM-PS) are being assembled. NASDA engineers received diving training for Weightless Simulation Test No. 4. Extravehicular Activity Weightless Simulation Test No. 4 was conducted in Tsukuba Space Center to prepare for Kibo launch and to ensure that Kibo design allows unimpaired repair or maintenance tasks.